Undermined by Mission Creek. The flats at 2119 Howard Street and the adjoining house sank both backwards and sideways. For more than twenty years Mission Creek lay sealed-in, directly beneath. 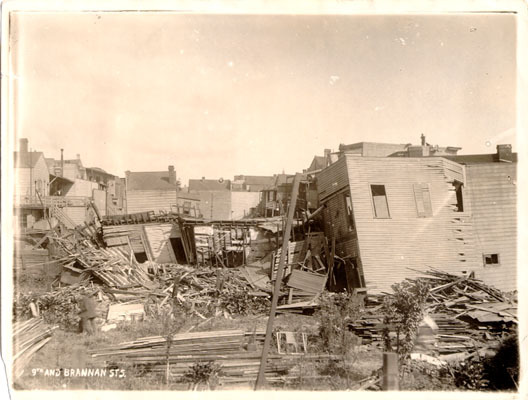 Howard Street (South Van Ness today) between 17th and 18th Streets after the 1906 earthquake. The spectacular sight of downtown San Francisco burning attracted everyone with a camera and film during those perilous days in April 1906. South Beach escaped the fire by a few blocks. The Oriental Warehouse at First and King was untouched, and earthquake damage in the Mission was not spectacular enough to compete with the smoking ruins of the demolished city. However, in a row of Victorian houses, several collapsed on their foundations while others did not. Their angle of repose was dramatic enough to catch at least one photographer’s eye. According to the penned note under the picture in Roy Graves’ scrapbook at the Bancroft Library, these houses were undermined because they were built over the subterranean waters of Mission Creek. The address is given as Howard Street, and the house on the right is number 2119. An 1869 Coast Survey Map laid over the 1906 street map shows a wide curve of Mission Creek formerly on this site; by 1884 the area had been filled-in and built upon. “With few exceptions these [water main] breaks may be segregated into several well defined groups which are located on areas of soft alluvium and in artificially or made ground and failures occurred in practically all such areas in which there were pipe lines. Investigation of the causes of the breaks located in apparently firm ground shows that the majority of those in the burned district were caused by the use of dynamite, by impact due to the fall of heavy portions of buildings on the streets directly over the pipes or by explosions of nearby gas mains. . . Built on Wetlands Adjacent to Mission Bay. 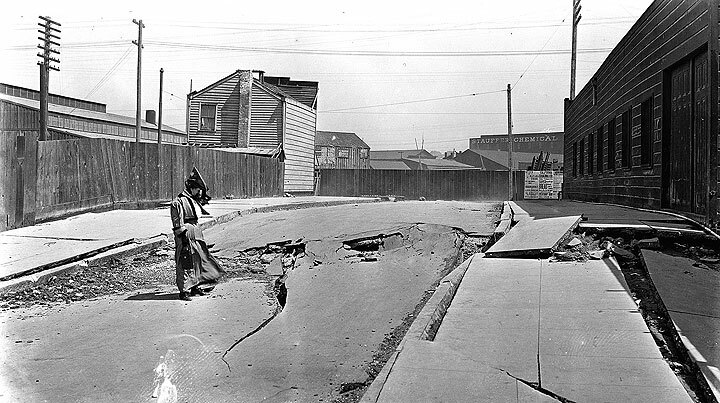 These massive cracks in Dore Alley near 10th and Bryant Streets from the 1906 earthquake were inevitable after the City spread across the former wetlands; land that is particularly prone to liquefaction during the severe shaking of a big quake. “From this investigation the following conclusions have been reached: First-the destructive effects of earthquakes in the City will be far greater in areas of soft alluvium and artificially filled or made ground, than on higher firm rocky ground. . . A review of studies made of other great earthquakes shows that investigators have generally found that the destructive effects were similar to those resulting from the California earthquake of April 18, 1906, namely, other things being equal, structures situated on firm rocky ground with the exception of those over or near a fault plane along which movement occurred, suffered comparatively little damage and the serious effects were generally confined to areas of soft alluvium or artificially filled or made ground.” (Italics as published.) Their conclusions are followed by notes from geologists and engineers regarding earthquakes studied from Port Royal, Jamaica, in 1692, forward to the Andalusian earthquake of 1884—all cite the problems experienced with structures built on marshy or man-made ground. Accompanying this investigative report is a map showing locations in the city where water mains of the Spring Valley Company were broken. The old Willows resort built in the 1850s flooded out in 1861; again this trouble-plagued site shows an alarming concentration of broken pipes between Eighteenth and Nineteenth streets. Here had been the fresh-water lagoon where the founders of the mission pitched their tents in 1776 and waited for word of the San Carlos. Further damage occurred on Harrison and Bryant—generally following buried Mission Creek’s meanders through the vanished saltmarsh. Butchertown Collapses. 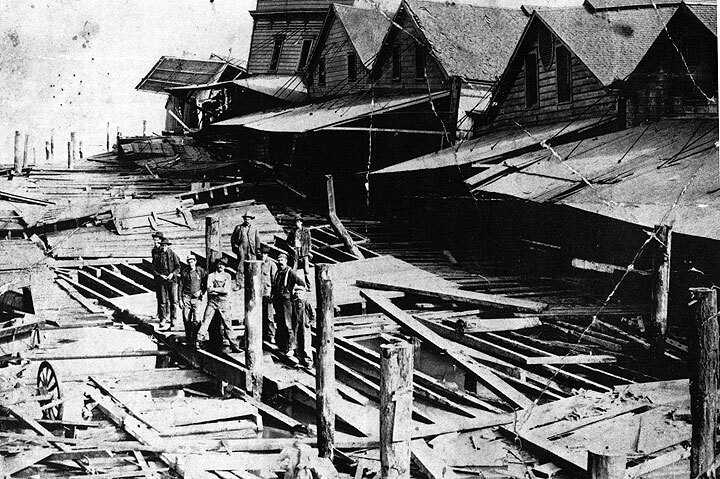 First Street, on the marsh of Islais Creek, the street that the butchers had piled and capped in the mid-1870s, collapsed, dumping wooden structures into the bay. The man in overalls, standing astride the two planks with his arms folded across his chest, is John James White—he recycled the sagging saloon front into a new home on Berlin Street. Workingmen on the Potrero were thrifty—everything was salvaged and put to use. Rebuilding San Francisco turned their economic lives around—at last everybody had a job they could count on. Of more than passing interest is the 1906 photograph of the collapse of Butchertown at Islais Creek. This is a rare view of a relatively insignificant place about to slide into the bay. Its importance lies in the fact that the Islais Creek drainage is the southern twin of Mission Creek and Mission Bay. 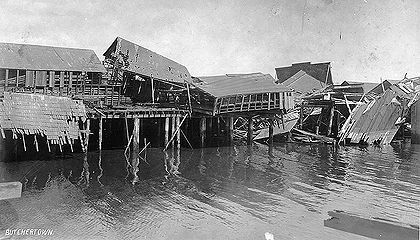 Collapsed buildings at 9th and Brannan, another location of major liquefaction during the 1906 quake, built on old waterways and wetlands. The persistence of such geographic features as underground streams and filled-in coves and bays is of great importance to city planners in San Francisco. An air view of the Mexico City earthquake of September 19, 1985, revealed that the worst damage to the city occurred within the outline of the ancient dry lake underlying Mexico City. 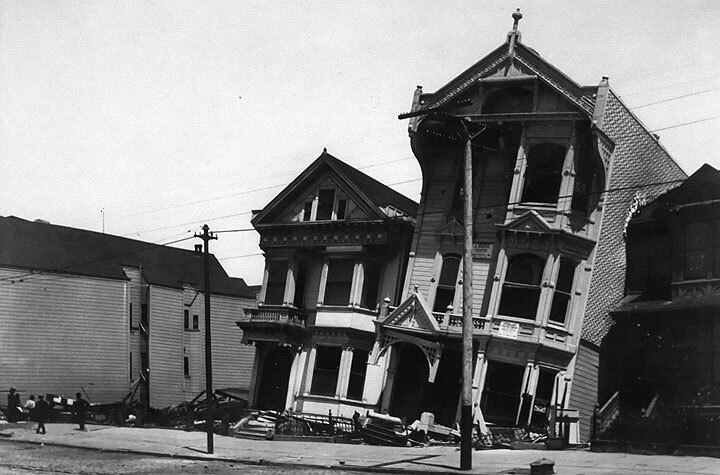 If there was one effect of the earthquake for San Francisco’s working class, it was to put everyone back to work for a substantial period of time. The building trades boomed and, on Channel Street, young William Kortum from Calistoga was at work in the E.K. Wood lumberyard. Kortum hoped to work in the yard rather than clerk in the office: “But scarcely a day did I spend at that occupation, for orders and teams came in by the hundreds and now I am at my old work again, only very much busier than formerly. . . As my work is much harder than before the fire I shall demand more pay in the future and as soon as things get settled, apply for work in the yard again. “On one morning we sell more lumber than in a week before the fire, and all the lumber firms must be getting rich. Of course payment is doubtful and all trade is a matter of lottery at present, but they seem to feel confident of getting their pay. “I am now sitting on a high lumber pile, in the warmth of the mid-day sun, just opposite to our yard office, the busiest place south of the channel, except for the Union Iron Works. Below me, dozens of teamsters are impatiently waiting for one o’clock to get their loads, while the tired and over-worked tallymen and yard-hands, their dinner over, are lying outstretched on piles or lounging in doorways. Some of the teams of horses have stood here for several hours, and as many more may pass away before they leave with their goods. This is chapter fourteen of "Vanished Waters: A History of San Francisco's Mission Bay" published by the Mission Creek Conservancy, and republished here with their permission. 112. Marsden Manson, San Francisco City Engineer, Report on the Auxiliary Water Supply for Fire Protection for San Francisco, California (San Francisco: Britton & Rey, 1908), 50-55. 113. Ted White interview with Nancy Olmsted, January 6, 1979. 114. William Kortum letter obtained from Karl Kortum.